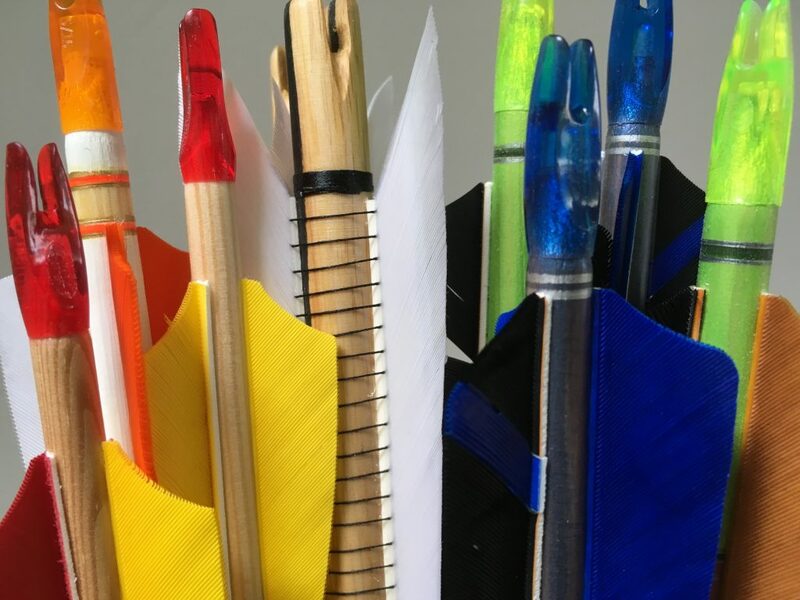 We can make arrows with a huge variety of fletching, from stock parabolic and shield feathers through to full length hand-cut warbow fletching. We even hand cut feathers supplied to us from birds managed in reserves such as pheasant, mallard, woodpigeon, goose and turkey. Straight fletching is the most traditional, using the natural curve of the feather to provide the spin and stabilising effect. It provides the least drag, but is also the least forgiving of a poor release. 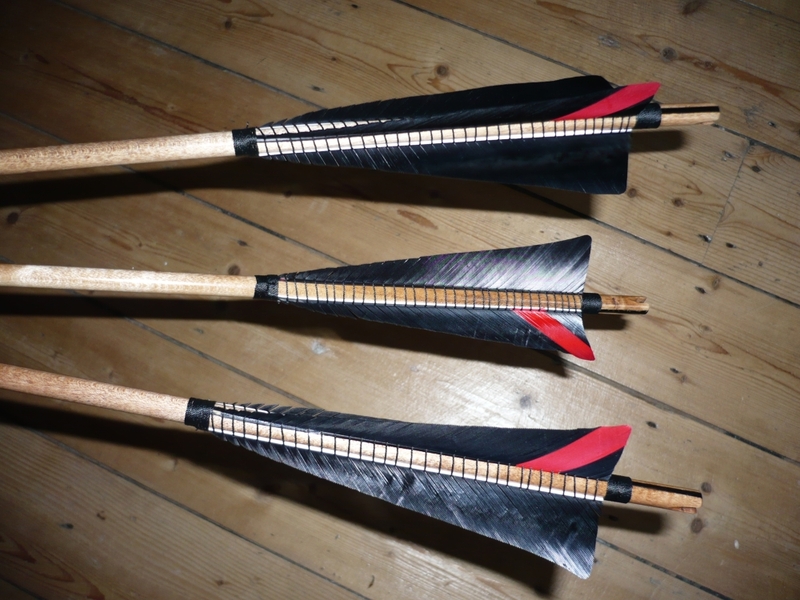 Offset fletching will impart more spin to the arrow early in flight, providing a good compromise between early stabilisation and low drag resistance - unless specifically requested, all of our standard arrows are fletched with a slight offset. Helical fletching is done with a specialist jig (or by hand) and provides rapid stabilisation which can be useful when shooting at shorter distances, and when a high Front of Centre (FoC) balance has been requested or is unavoidable due to high point weight. There have always been arguments about this, and five archers will tell you six different things about which wing the feather should come from, depending upon how you shoot. In reality, we've never found any difference! The myths make for great stories, but without any clear evidence of a benefit, we'll carry on using whichever feathers we can lay our hands on, as archers have for millenia! Obviously we'll fletch all of your arrows with fletches which curve in the same direction, as this is important. Most of our stock fletching is right wing. Specials may be either, but we will make sure your set match! 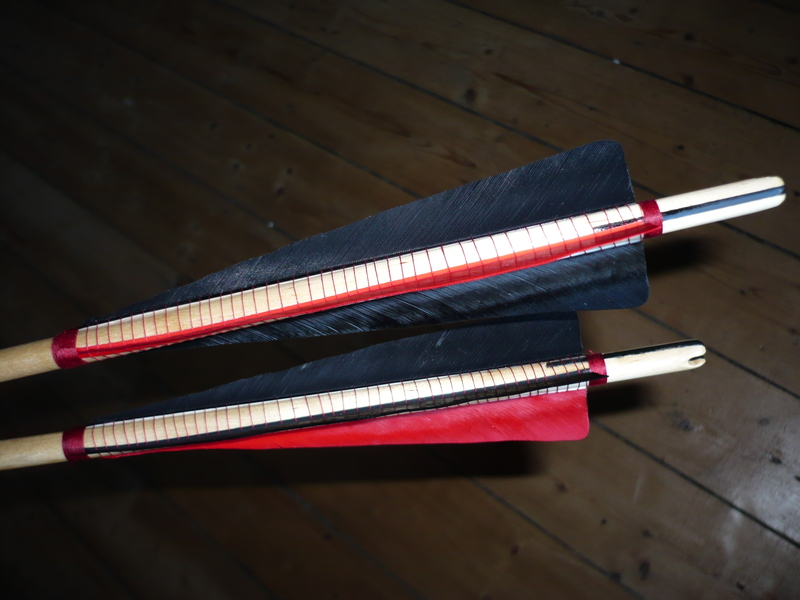 Shorter fletching provides less drag, providing higher site marks and longer distances. Longer fletching provides stability and accuracy especially at shorter distances. The choice of shape is mainly aesthetic, though some shield shapes can provide a bit more drag/stabilisation, with pro’s and con’s associated. If you’re unsure which to go for – let us know what kind of shooting you do, and over what distances and we’ll give you a suggestion or two. We keep stocks of most solid colours, and are happy to source patterned camo, tre and specially printed fletchings on request. 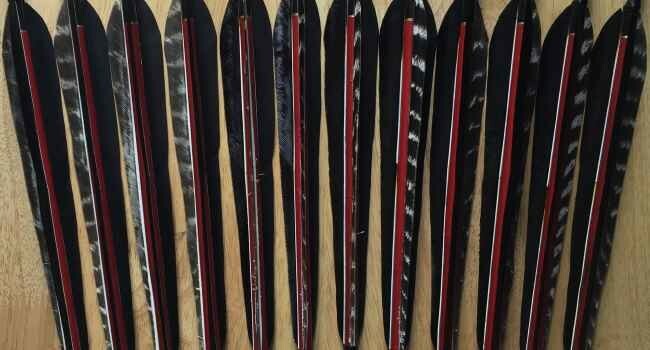 We have a pretty good stock of full length turkey feathers which we can cut to your style. Many of the longer fletching shapes aren’t easily available, but we cut all of our longer fletching in-house. We have templates for the majority of styles, from EWBS standards to Manchu fletching. 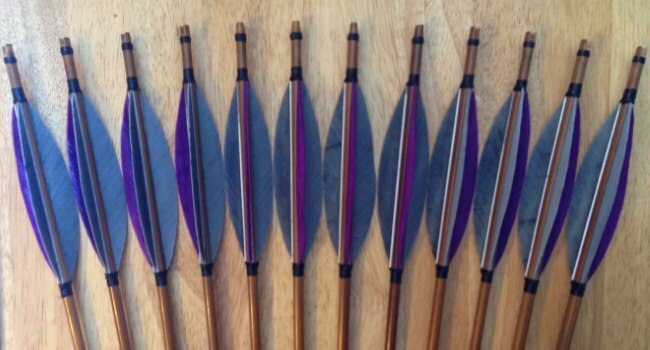 If you want to design a feather shape which is unique to you then we can do this and use it on your arrows. We can cut fletches to your shape (as long as it’s possible!). 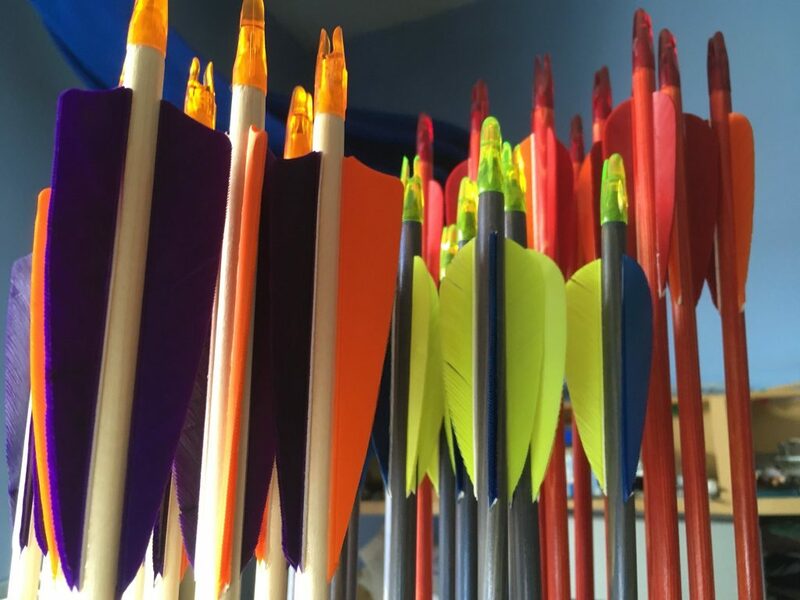 Just send us your design and we will replicate it – we’ll post you out a prototype for you to assess, and as long as you’re happy, we’ll put them on your arrows. This isn’t a highly technological enterprise – it usually involves scissors, but we’ve got quite a bit of experience at cutting strange shapes, so as long as you accept their hand-crafted qualities, this is a unique way of personalising your arrows. We have stocks of some feathers in on a regular basis, and try to always have white and grey goose feathers, or naturally barred turkey feathers in stock. Seasonally, we may be able to obtain feathers from other birds, including wood pigeon up to 3″ (thin and light, mid grey, fades through pale grey to dark grey at the back of the feather), mallard up to 2.5″ (irridescent blue, a very shallow feather which has been used for distance shooting), and several barred feathers from pheasant and wild turkey. 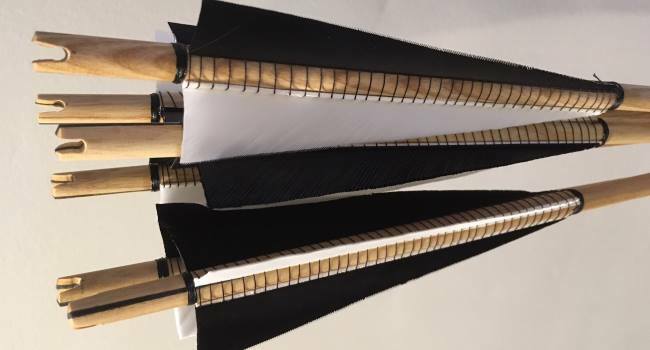 We’ve also made fletching from peacock eye feathers (yes, these are ludicrous, really hard to do and the effect is pretty awful - there's a picture below if you want the proof!) – peacock wing feathers, however, are traditional, with a beautiful deep red-brown colouring, sometimes mottled, but are slightly less impressive! We’ve also made flu-flus from ostrich feathers (lots of fun, and extremely showy! ), as well as using other materials including pages from a novel and leather. For any non-standard feathers, we do our best to ensure that all feathers are from sources which follow CITES guidance. 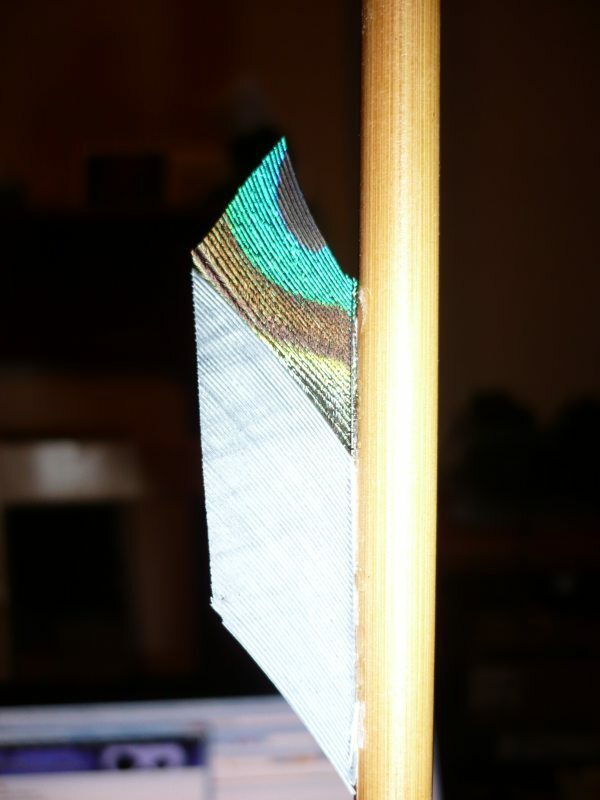 This method involves cutting in part of a different coloured feather into a fletch, providing a stripe (or series of stripes, if you want to make it interesting!). It is a distinctive way of individualising your arrows which dates back at least to the Victorian period and probably much further. 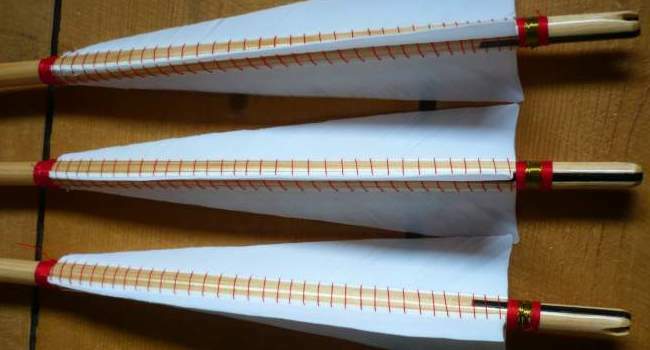 Binding of fletching has been done from the very beginnings of the fletched arrow. Traditional glues and pitches were often unreliable, so fletchers would ensure that the feather didn't part company from the shaft by binding the feather on with twine, rawhide, nettle or hemp fibres. In medieval times, linen and silk were used, and these days many bound arrows use synthetic thread. 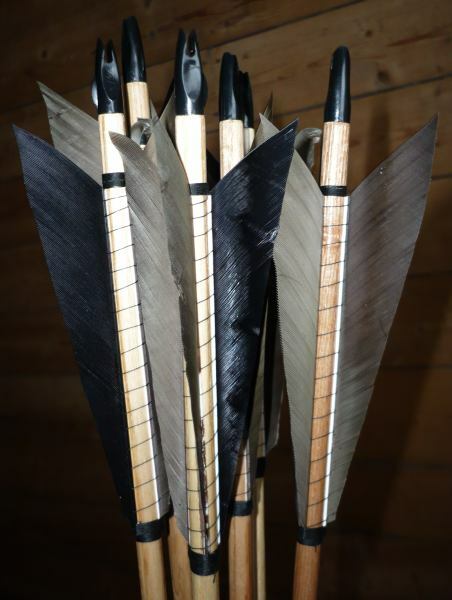 Arrows from the asiatic tradition would often be bound at the leading and rear edges of the feathers only, and many modern archers will bind the leading edge of a feather fletch to ensure that the sharp point of the quill doesn't catch on either the bow or the hand the arrow is shot from. Whether you want simple shapes and colours, or something seriously flash, we can help. 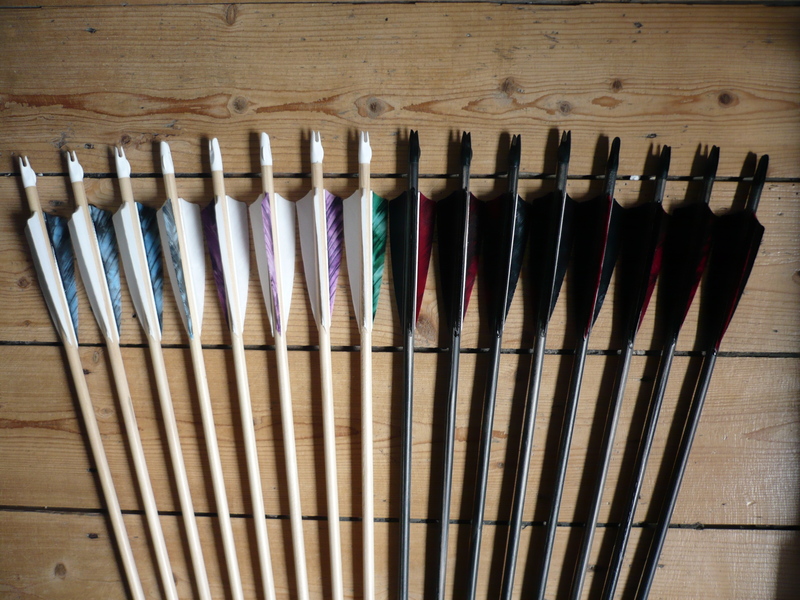 We can also help you choose which type of fletching will suit your purpose – a flight arrow for a long draw on a horsebow will have very different feathers to a target arrow for a short drawn longbow – hopefully we’ll find you a good match.